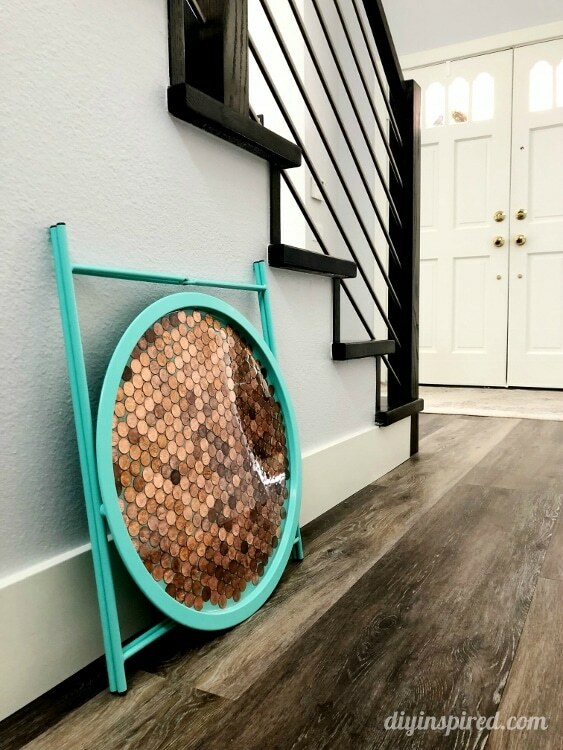 This article, DIY Penny Table is sponsored by Bernzomatic. All opinions are 100% my own. 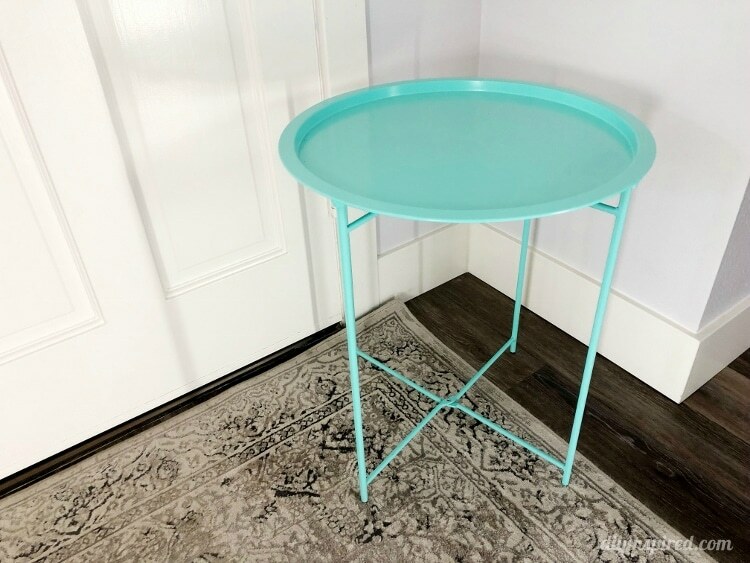 I found the perfect table for this project. Here is the BEFORE photo. For this project I used a little over 400 pennies. Most were old and dirty and needed a good shine. 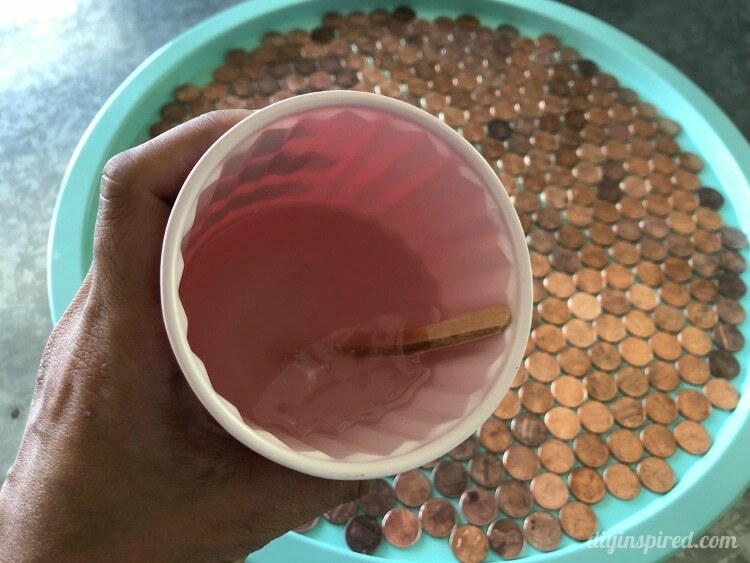 I go into depth in 7 Ways to Shine Pennies on how to polish old pennies. For this project, the best way to this is the cleaning vinegar and salt method. First, place about a tablespoon of salt into the bowl and add the cleaning vinegar. Next, mix the solution until the salt is dissolved. Add several pennies. You will see the transformation immediately. Give the bowl a few swirls and watch the pennies brighten. 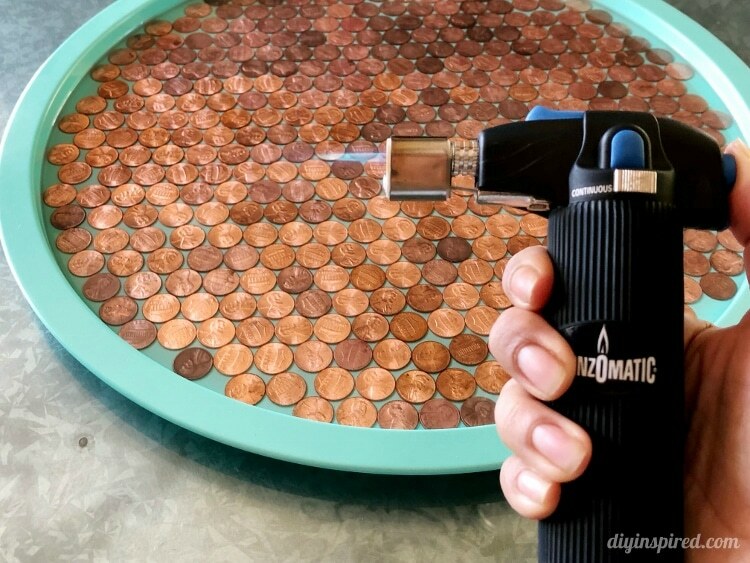 Lastly, remove the pennies a few at a time and lightly polish dry with a paper towel. I recommended doing about 3 batches of pennies at a time and them starting a new solution for the next three batches and so on. DIY Tip: Set the dry polished pennies on top of the tray table as you go so you know when to stop. 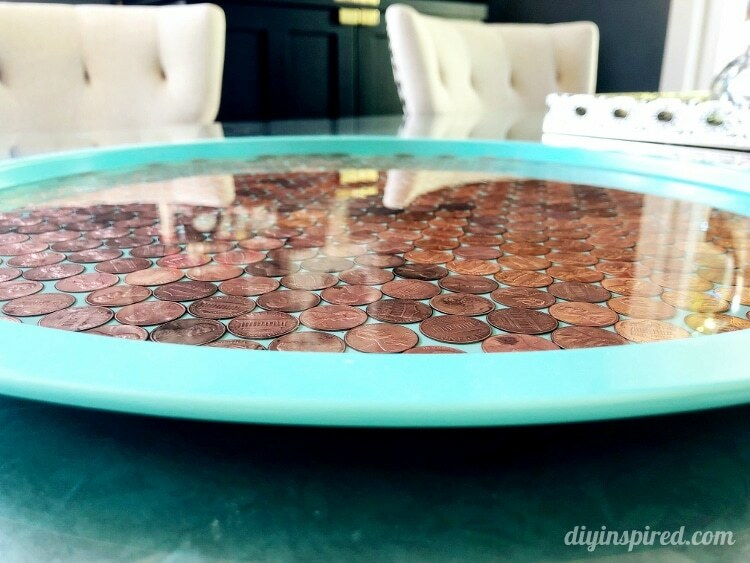 Once all the pennies are polished, you want to arrange them on top of the tray. This can get a little tricky. I found it best to give the tray a tilt and a slight shake to allow the pennies to naturally fall into place. You will have to repeat this process several times to get the right placement. For this project, I used a two-part clear coating and casting resin. First measure equal parts. This tray took approximately 120 cc’s. Pour together in a plastic mixing cup and mix slowly for about 1-2 minutes. Next, slowly pour resin on top of the pennies. Gently tilt and shake the tray to spread the resin out evenly to cover the entire tray. If you did not make enough, there is time to mix more and pour. After pouring the resin, allow it to dry for 10 minutes. Meanwhile add Bernzomatic butane to the Bernzomatic ST2200T Micro Torch. Ignite the flame and pop any remaining air bubbles using a slow and even movement. I found that there were more bubbles around the edges of the tray. Allow the tray to cure for 18-24 hours. Here is the final project! 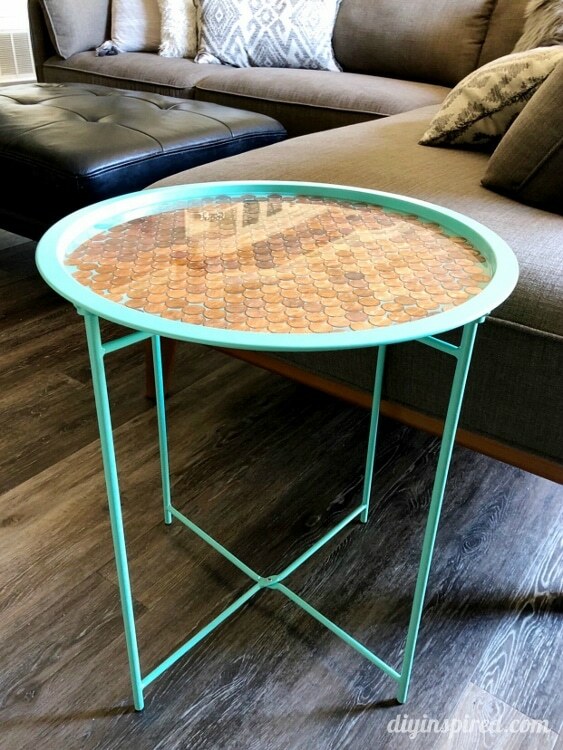 Here is the penny table folded.